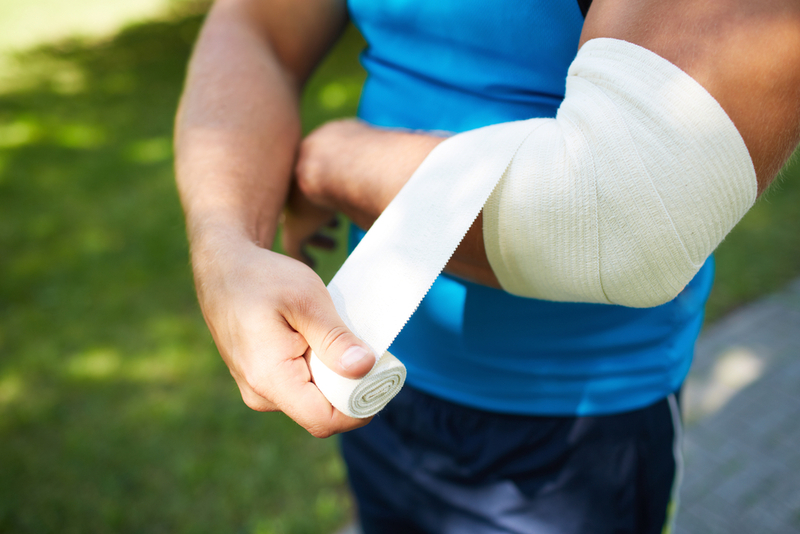 Injuries sustained as a result of an accident can be life changing. They can affect your quality of life, your ability to work and your financial stability. That's why it's important that you are adequately compensated for your loss. Many people who think they have a personal injury claim aren't familiar with the process of making a claim, what is required of them or even if they really have a claim to begin with. 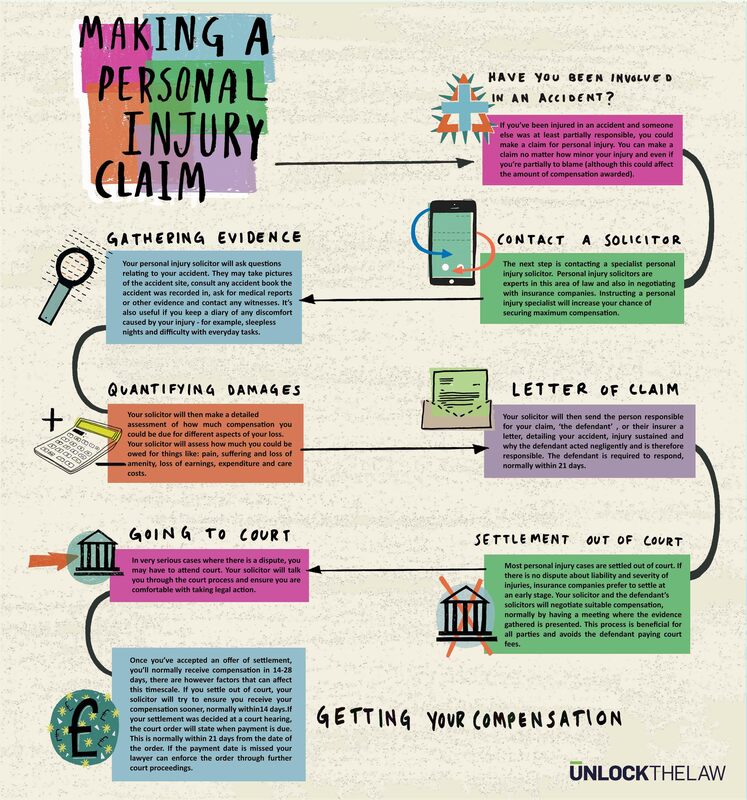 This guide is designed to answer any questions you may have in relation to making a personal injury claim. It will help you understand whether you have a claim, how to go about making a claim and how your claim will progress. For help at this stage please call 01252354412, or fill out the form at the top of the page. What information do I need to have in order to make a claim? The details of your injuries including any medical diagnosis and/or any treatment received. You should retain evidence of this. Whether you are a member of a Trade Union. This may mean that you can receive free or reduced cost legal representation. Call free today 01252354412, or fill out the form at the top of the page to discuss your position. Proof of any loss of earnings and other expenses that are the result of your injury. Any documents relating to insurance policies you may have (household insurance, motor insurance etc.) as these may cover the legal costs for your claim. Even if you are lacking some of this information you may still be able to make a claim. For expert advice today please call 01252354412, or fill out the form at the top of the page. Do I need a personal injury solicitor to make a claim? You may think your accident was so clear cut that making a claim will be straightforward and therefore ultimately easy to win compensation. However, personal injury cases are often complicated by a multitude of different factors and it is important to be aware of all different aspects when you begin a claim without legal representation you may soon find a number of obstacles getting in your way. A personal injury can be life changing and a compensation award can make all the difference. Compensation awards cover many aspects of loss from loss of earning to pain and suffering, medical expenses and a decline in quality of life. Arguing for each of these factors can be challenging, especially if you do not have a thorough grasp of the law in this area and familiarity with previous cases. What can a specialist personal injury solicitor do that you can't? Personal injury solicitors can ensure you receive the maximum compensation due to you. Your claim may involve complex legal issues, meaning it is difficult to argue your case, or you may overlook a vital point of law which could result in you receiving less compensation. Personal injury specialists will have extensive knowledge of all aspects of personal injury law and as well as vast experience of working with relevant case law in the area. This specialist knowledge and experience will guarantee that you receive the maximum amount of compensation owed to you. When is it essential to contact a personal injury solicitor? Severe injuries – This includes brain and spinal injuries or another injury in which you suffer significantly reduced capacity. In addition, insurance companies fundamentally do not want to pay large sums of compensation regardless of whether this is owed to you or not. Personal injury solicitors have great experience in dealing with unwilling insurance companies and can ensure you receive the compensation you deserve. Sometimes even having a solicitor will be enough to make an insurance company offer you a fair amount of compensation rather than face a trial they are likely to lose. What are 'no win, no fee' accident claims? 'No win, no fee' is just as it sounds. If the solicitor decides to take on your case, you will not pay any fee unless your case is successful. You will enter into what is known as a 'conditional fee agreement' with the solicitor that will set out the terms of the agreement. You will normally pay the solicitor a percentage of your compensation claim and potentially any court costs, however this will be negotiated with your solicitor and set out in your conditional fee agreement. This is fair for the solicitor as they are taking on the risk of your case. The main benefit of no win no fee is that it allows you to make your claim without any upfront cost. Furthermore, most law firms offer free consultations. At this consultation meeting the solicitor will ask questions about your claim to assess whether your case has a good prospect of success. The solicitor will only take your case if they think they can win – otherwise they don't get paid. This is beneficial as it means you won't run the risk of wasting your time or money on a claim that won't be successful. With no win, no fee you can be confident from the outset that your solicitor is looking to get you as much compensation as possible. What should I look for in a good personal injury solicitor? First and foremost, you should look for your solicitor to be a specialist in the area of your claim. If you are in a road accident, or have a case for medical negligence for example, you should look for personal injury solicitors who are specialists in these areas. Experience in dealing with cases similar to yours is crucial to the success of your claim. You should check out the track record of your solicitor, if they have a lot of experience in your type of claim they will be better placed to create a good strategy for your claim, advise you of how long different aspects of the case will take and give you an indication of the likely outcome. Seeking out a solicitor who is upfront and honest about payment should also be a priority. If possible, you should look for the kitemark of APIL (the Association of Personal Injury Lawyers) - a highly reputable national organisation of personal injury solicitor. APIL accredited solicitors follow a code of practice and are kept well up to date with developments in their practice area. It is also important to consider how you will fund your case. Many solicitor will work on a no win, no fee basis. This means you will pay no fees unless the solicitor wins your case for you. This can be useful as you will have no upfront costs to pay. How will my accident claim progress? The first step in your personal injury claim will be for your solicitor to send a letter to the person you are holding responsible for your accident (the defendant). This letter will set out the details of your injury and the circumstances under which you were injured – including why you are holding the defendant responsible. The defendant must reply to this letter within a certain amount of time, normally three months. Usually the reply will be much quicker. In their reply the defendant must state whether they accept or deny responsibility for your claim. Your solicitor will tell you what they think the value of your claim is and ask you what you are willing to accept and whether you would like to make an offer to settle (known as a part 36 offer). They will also explain what making this kind of offer will mean for you. Will a settlement amount be agreed before court? If the defendant responds reasonably and accepts liability, they will usually settle your claim out of court with an amount of compensation agreed by both parties. If you are unable to agree to an amount with the defendant, your solicitor will advise you whether or not to take court action. Equally, if the defendant claims they are not liable for your injury, your solicitor will assist you in challenging this in court and making a compensation claim. Personal injury claims don't often progress to court as this results in considerably increased costs. Normally personal injury claims are settled out of court for an amount agreed by both parties following negotiations. If there is no dispute about liability and severity of injuries, an insurance company would much rather settle out of court. However, where there is a dispute and liability is contested or a settlement agreement cannot be reached, as is often the situation with very serious cases, you may have to attend court. Your solicitor will talk you through the court process and ensure you are comfortable with taking legal action. How much will my compensation claim be worth? How much can I sue for? It is difficult to assess how much a compensation claim could be worth. There are many facets to a personal injury claim and each is assessed in light of the specific circumstances. Your solicitor will tell you what they think the value of your claim is and ask you what you are willing to accept and whether you would like to make an offer to settle (known as a part 36 offer). They will also explain what making this kind of offer will mean for you. 'Loss of amenity' – this is any reduction in your quality of life as a result of your injury. This could be that you are unable to participate in your hobbies anymore or are unable to carry out certain everyday activities. Loss of earnings – this includes loss of potential and future earnings if you are no longer able to work, or work full-time. Does the law on accident claims differ across the country? When am I likely to receive my compensation? Court settlement – If your personal injury claim is settled as a result of a court hearing, the court order will state when payment is due. Usually, this will be 21 days from the date the order is made. If payment is not made on this date, your solicitor can enforce the order through further court proceedings. Some insurance companies will send the compensation as soon as they receive the court order, meaning you could receive your compensation money within as little as 5 days. You should ensure you solicitor has your bank details so they can make a BACS transfer to you when they receive the compensation. Otherwise you will receive a settlement cheque in the post that could further delay receipt of your compensation. If you are based in the Leeds area you can find more information here. Click here for help in the Greater Manchester area.